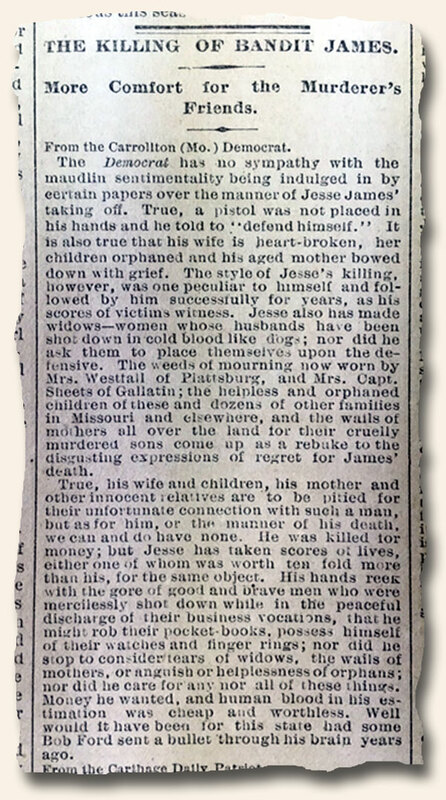 It is not surprising that a Missouri newspaper (April 13, 1882) would care more about the death of Jesse James than newspapers from other states. He was killed in St. Joseph. And this being his home state, there were grumblings by many who were critical of how he was killed. 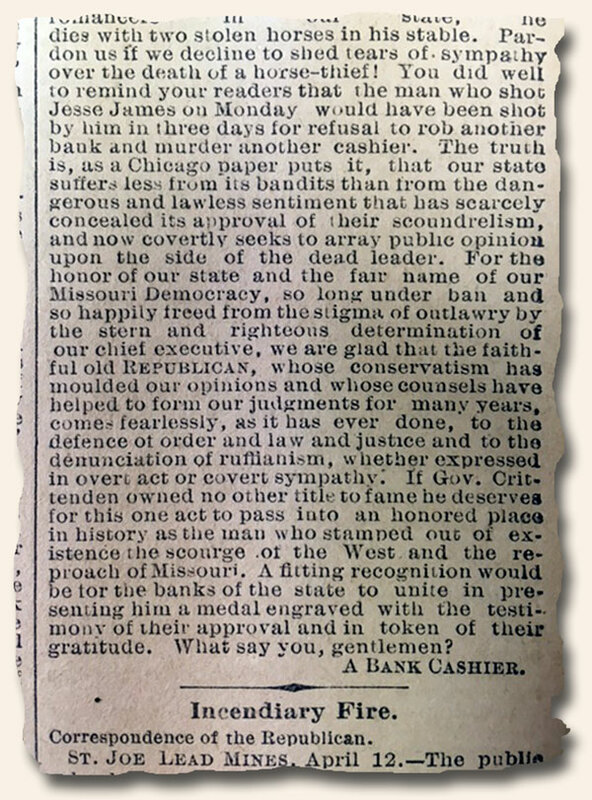 This editor pulls no punches in acknowledging the state should be glad to get rid of Jesse James, and the ‘bleeding hearts’ who bemoan his death are not accepting the reality of his terror-ridden career. 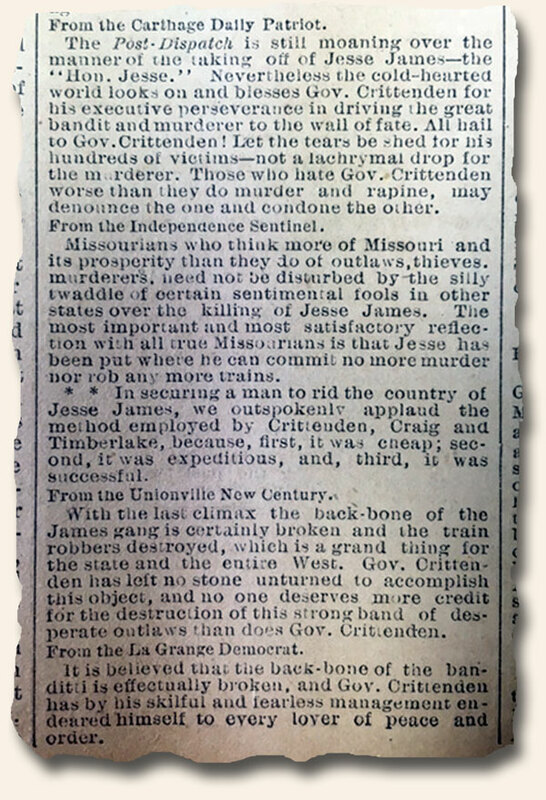 Two articles have very interesting content, one including: “…True, a pistol was not placed in his hands and he told to ‘defend himself’…” and: “…Missourians who think more of Missouri and its prosperity than they do of outlaws, thieves, murderers, need not be disturbed by the silly twaddle of certain sentimental fools in other states over the killing of Jesse James…” with more (see below). 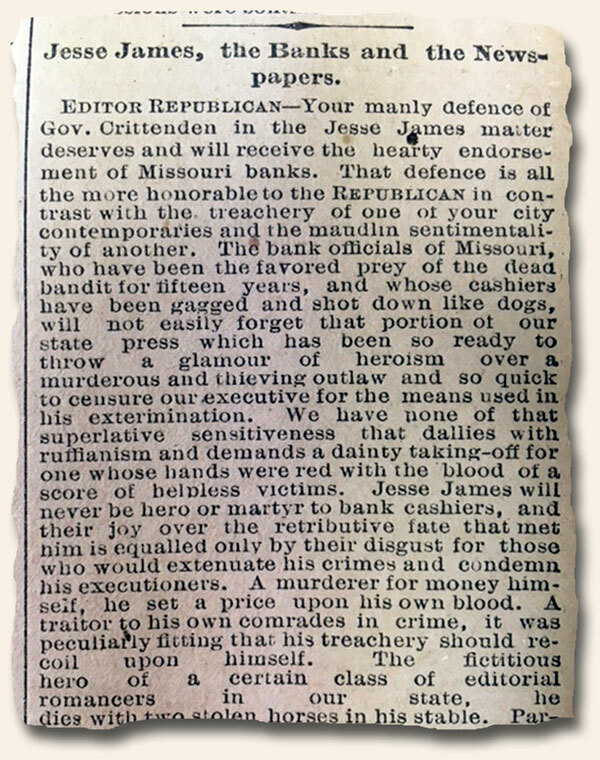 The other article has a similar theme, including: “…The bank official of Missouri, who have been the favored prey of the dead bandit for 15 years and whose cashiers have been gagged & shot down like dogs, will not easily forget that portion of our state press which has been so ready to throw a glamour of heroism over a murderous & thieving outlaw and so quick to censure our executive for the means used in his extermination…” (see below).